You are here: Home / How much should I pay for a VA? There is a lot of speculation around how much you should pay when outsourcing and I have to admit at times this can be a ‘How Long is a Piece of String’ question. 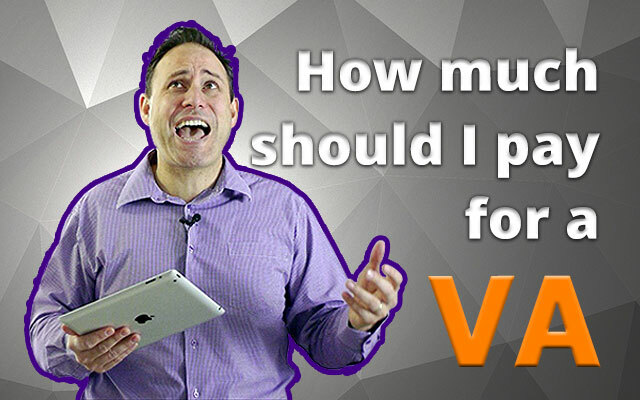 In this video, we delve deep into this subject and cover the concept of getting what you pay for. How much should I pay for a VA and/ or outsourcer. Ok, I can’t handle it, this music is far too heavy. I know this is an important subject but what’s say we keep it a little bit lighter, yeah? Now this is actually a subject which is really close to my heart and it sort of frustrates me when I speak to a person that tells me they can get a V.A. for Peanuts. This is why I think it’s important to cover this idea in a little more detail and the concept of you getting what you pay for. Everybody loves a bargain and when I think back at the beginning of my outsourcing journey I’d have to admit that was my approach. I would employ people all over the place looking for the person that could get the work done at the “Right Price”. My first bad experience was years ago when I was looking at getting social interactions for a clients facebook account. They looked in their analytics and they saw all of the likes were from Banglasdesh and the accounts with the likes… They were all fake people. To top it off, their facebook page was suspended 5 days after that and I lost the client (and they were using multiple of my services which cost my hip pocket). It took a few more hard lessons just like this one and I realised this was actually affecting the reliability and the consistency of my business. I could keep going here with examples of clients that have come to me that had that style of VA and the sort of damage it’s done to their business and reputation, but I want to move on to why this kept happening to them. The Right Skills – People would say they could complete the job, but they either didn’t possess the skill level or they wouldn’t complete the task the way I wanted, which impacted how I looked with my client. Due to some of the cultural differences I even had a person once post something totally inappropriate on a client’s facebook page as they figured we found that sort of thing acceptable. Constant power – Issues with power losses which impacted the ability to get jobs done with consistency and not delivering on time.. This really hit home with me that certainly I could find people for really cheap prices but I realised the quality of person that you get is a reflection on the nature of business you run. This relates to all parts of business from data entry to social media (and I tell you I could share a few stories on things that have gone wrong for clients before they came to me in these areas). So the result for me? I realised the more time I invested in getting people and setting up an infrastructure (power and internet) meant I could get a more reliable person that would become an incredibly valuable member of my business. We’re talking people that are better, smarter and more efficient than I am, which means I can confidently delegate and know the JOB WILL GET DONE! How Much Do You Pay to Outsource? I don’t compare my team (and my clients I get VA’s for) with $2 outsourcers. I compare them to a person that I would be paying 3 times the price for locally and my outsourcers are just as good, more educated, constantly upskilled and Damn Loyal! So the answer to the question is – ‘a third of the price you would be paying someone to do it locally’. Sure this costs more, and In my mind there’s no comparison. Last question, how often do you buy from a bargain shop and what do you think of the quality of what you’re going to get? Ask yourself, how does apply to your business and the sort of results you want to achieve. Ok, cool. Lets wrap up and talk about what’s next. I’ve made a heap of mistakes in my outsourcing journey and have come across some stories that would curl your toes and you’ll hear all about it in the next video.